The first time I ever saw one was Sunday, Aug. 20, 2006. I lived in Somerville-Winchester-Medford area all my life... Since it scared the crap out of my daughter and I, I killed it (oops). This morning, on my way to work, I saw the characteristic sand mound in my neighbor's front yard, so I'd say we have a new family of them living in Medford. I'll give you the address, you can come by and take it home with you. Yep, that's the one. I couldn't tell if it was male or female though but that's not too important. It would be interesting to see if there are any others. 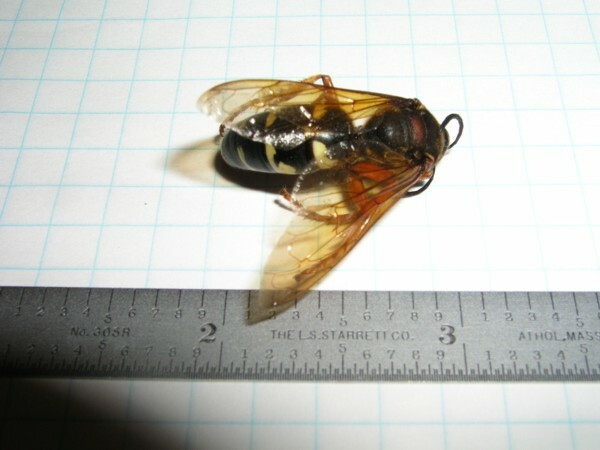 Usually however, Cicada killers are solitary wasps. I think I mentioned previously that males don't have stingers and females are extremely non-aggressive. 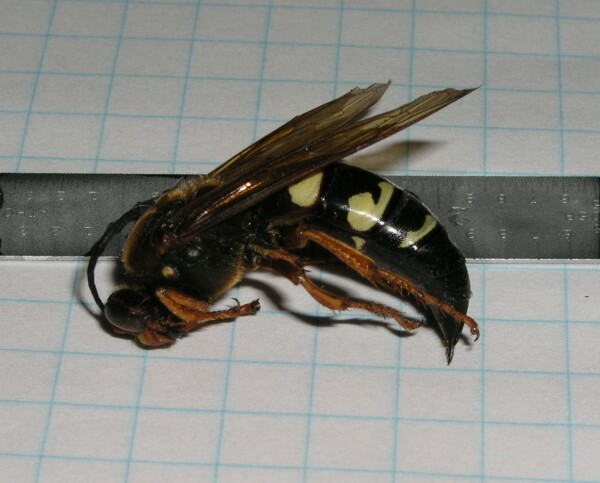 The only way you would be stung is by catching one in your hands and squeezing. I've actually stolen stung cicadas away from cicada killers many many times. To insure the accuracy of the data, can you provide for me the missing information? Thanks Jim I really appreciate it.